We are thrilled to be hosting Marci @ Retreat in her recurring guest star role. She will be at Retreat every 6-8 weeks. Marci re- located to Portland via SF a few years ago, and since her clients couldn't live with out her, she is now back in SF. She will be sharing her hair artistry and vast knowledge of Davines products. Appointments available 10am-8pm. Marci began her hairdressing career in 1998 while finishing her Senior year of High School. When she wasn't rocking it behind the chair, she was rocking it on stage with her band. After an extensive apprentice program based on Vidal Sassoon precision techniques, education became a top priority. Over the past 18 years Marci has traveled all over the globe learning from the masters of the trade. Marci has educated for some of the top companies in the world and continues to spread her love of learning through coaching and consulting in the Hair community. 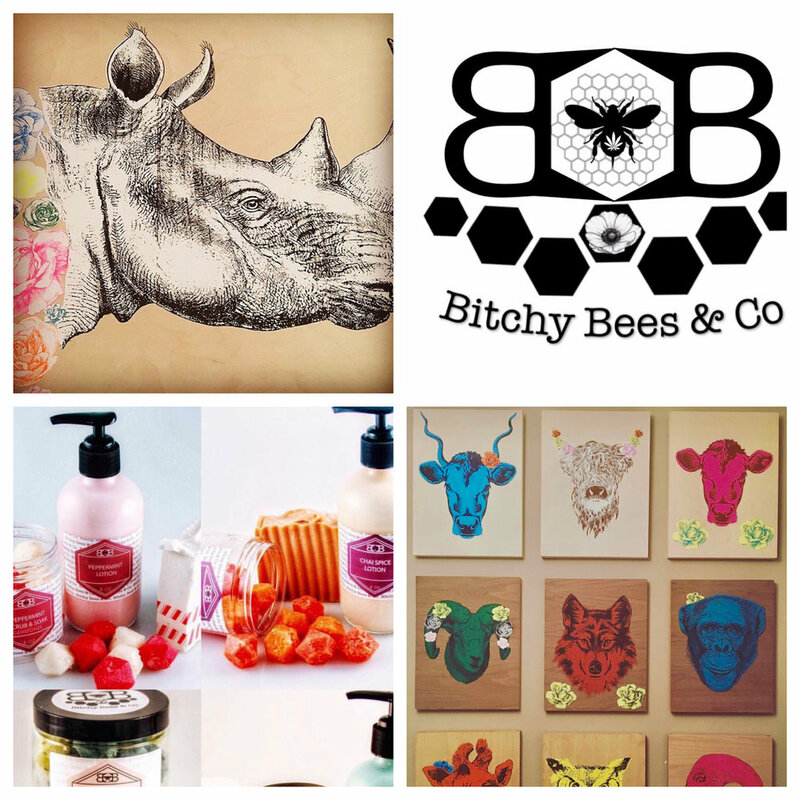 The art work of Sita Rupe and Pop Up Shop by Bitchy Bees CBD infused Bath and Body line. Sita will have smaller works and works on paper the day of the event that folks can cash and carry, aside from the work for sale on our walls. Bitchy Bees will be selling their Holiday bath and Body line in both CBD infused and non - infused options. GREAT HOLIDAY SHOPPING FOR YOURSELF OR LOVED ONES, AND A WAY TO SUPPORT LOCAL ARTISTS AND ARTISANS! Sita Rupe is a bay area artist who has spent her entire career working in multiple medias, specializing in photography, painting, sculpture, and design. She has a unique eye when it comes to photography, and design and has implemented this over the past decade in her painting work. Her paintings are created using a multi-step process that layers acrylic painting and silk screening on plywood, that she then seals in resin. Sita's work is very accessible and often bought in groupings since the pieces look so great together, several of her pieces are in Michelle's personal collection. Bitchy Bees is all about taking ownership of their own health and beauty products by harnessing the powers of bee and plant magic. They are a team of four; two beekeeping couples each living on a small urban homestead in the California Bay Area, where they collectively grow hundreds of plants, and look after 5 thriving hives, that provide the oils, tinctures, beeswax, honey and propolis for their products. In addition to the herbs, flowers, fruits, vegetables, and other plant matter they grow for the products, they also cultivate legal CA hemp. They believe that hemp is a powerful healing plant that can not only penetrate the skin to provide deep pain relief but can also be an incredibly effective addition to a beauty care regimen. Cannabidiol, most commonly known as CBD, is one of the 113 active cannabinoids in hemp. We are teaming up with the experts at EverStrongSF this weekend to host a joint Open House. Pop into EverStrongSF at 218 Fillmore Street and learn about their unique strength training. Meet the owners/estheticians of Retreat Skin & Hair Studio at 146 Fillmore Street; learn about our philosophy of self-care and get your skin care questions answered. EverStrongSF is an evidence-based strength building facility. With one-on-one personal guidance using strength training robots, people get strong in just 20 minutes a week. It's effective, efficient and very safe. EverStrongSF has clients aged from 17 to 80 and are expert at working around injuries or concerns about training safely. They do a complimentary 1-hour introductory session to personalize, educate, train and make sure it's right for you. 10% off first month membership when booking a demo session night of Open House. All appointments booked at Retreat during our Open House will receive a 15% savings. We are thrilled to be hosting Marci @ Retreat in her recurring guest star role. She will be at Retreat every 6-8 weeks. Marci re- located to Portland via SF a few years ago, and since her clients couldn't live with out her, she is now back in SF. She will be sharing her hair artistry and vast knowledge of Davines products. We are elated to announce, Sky Chari of Whole Woman Coaching will be presenting a talk at Retreat to share her coaching philosophy rooted in self-love, nutrition, and emotional work. She pulls from her own personal experiences and the myriad areas of study and techniques she has utilized in her own journey. Sky will be offering guidance and tools for taking care of our bodies and spirits mindfully and compassionately. Join us for a casual evening of lively discussion, tips and healthy snacks. Bring your friends and questions, we can’t wait to share what we know will be a magical night that will empower each of us to breakout into our own individual badassery! RSVP to this event via our Facebook Page or email us at info@retreatsf.com. Retreat is thrilled to host a summer soiree to celebrate LA based artist S.Lee Robinson, and her solo art show "FIGURINE" featuring all new black and white works. John Hadeed, owner of Torso Vintages will also be presenting Love Boutique, a pop up shop of fabulous curated premium vintage wears for the fashionistas in the crowd. Bring your celebratory spirit and be prepared to blow your allowance on art and fashion at it's finest. We are thrilled to be hosting Marci @ Retreat in a guest starring role that will re-occur every 6-8 weeks. Marci re- located to Portland via SF a few years ago, and since her clients couldn't live with out her, she is now back in SF. She will be sharing her hair artistry and vast knowledge of Davines products. Here at Retreat we always have our finger on the pulse of what is going on in the world of skin care. Cannabis is becoming the new "it" ingredient on the market. CBD has been shown in pre-clinical studies to have antioxidant and anti-inflammatory benefits, which may aide in healing and correcting most skin conditions. Join cannabis skincare product formulator Bridget May of Little Green Bee and the estheticians of Retreat for a discussion where you’ll learn about how cannabis works to rejuvenate skin. This event is in partnership with SAVA and Little Green Bee. This is a non-consumption educational event. SAVA delivers a curated cannabis collection to your door, along with the support and education you need to use cannabis for wellness. Little Green Bee was founded by Bridget May, who studied botany and is trained as an analytical chemist. Her passion for herbal and holistic medicine, including cannabis, led her to develop scientifically based formulas to heal and beautify the face and body. Sava will be giving out a 10% discount code to all event attendees, and Retreat will give a 15% discount on any skin care service booked that evening for the month of May.